Do you like to read? Are you looking for a place to start with health coaching? Consider taking a book study with me. Choose a book below and, together, we will schedule reading assignments and coaching sessions to discuss how to apply the contents of the book to daily living. 30 or 60-minute sessions by phone, in person, or by e-mail. Visit HERE for package pricing. Are you gathering friends together for a book club? Most of these books are ideal for group discussion. I'm happy to facilitate a group of 4-8 people. Contact me for affordable group pricing and availability. Click any book covers below to learn more or place your order from Amazon. Explore five essential areas of your life: faith, food, fitness, focus, and friends. Recommended reading to begin your healthy journey. Excellent for individual or group coaching. for changing them. 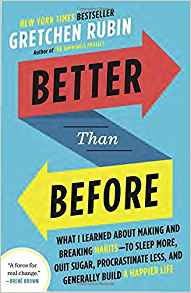 Better than Before explains the (sometimes counter-intuitive) core principles of habit formation. Ideal for individual study or a group coaching. Take a deep dive into your inner-being. Let go of who you think you're supposed to be and embrace who you are by exploring ten guideposts on the power of wholehearted living. Deeply private discovery is ideal for individual coaching and may be useful in an intimate, trustworthy group. This important book offers a new way to understand our relationship to food, focusing on quality and the pleasure of eating to transform and improve metabolism. Suitable for individual and group coaching. Discover how to be happier with small, actionable steps as you follow the author through twelve different monthly happiness projects. This is a lighthearted, easy read. Ideal for individual and group coaching. Financial security is very important to your overall well-being. Whip your finances into shape with Ramsey's no non-sense advice. Individual or group coaching available. Watch for new additions coming soon!